Earlier last year, Cloudfare Inc., a website performance and security company, had rolled out a new free public domain name system (DNS) resolver service with 1.1.1.1 as its IP address on April Fool’s day. Later that year, it rolled mobile apps of the 1.1.1.1 privacy-first DNS resolver service for Android and iOS users. To celebrate the first birthday of its 1.1.1.1 DNS resolver app, Cloudflare has announced a new free VPN service called Warp for mobile devices. 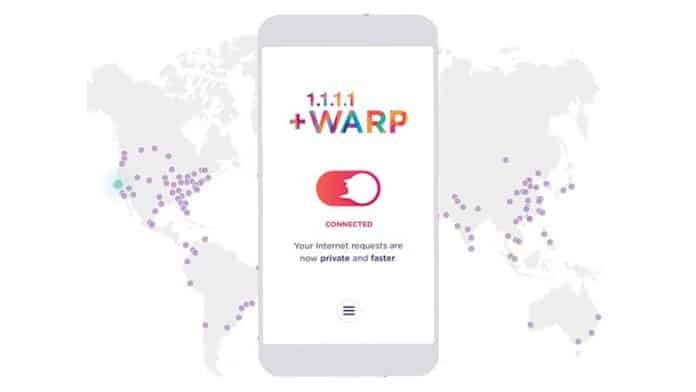 While the aim of 1.1.1.1 DNS service is to provide users’ faster internet connection and offer utmost privacy, Warp is being marketed as “VPN for people who don’t know what V.P.N. stands for.” The company claims that most VPN services are lousy because users are experiencing a slower internet connection. For those unaware, VPN stands for Virtual Private Network that allows users to create a secure connection to another network over the internet and also ensure that their internet traffic is protected. VPN uses encryption and other security mechanisms to protect the private network and ensures that only authorized users can access the network and that the data cannot be intercepted. Cloudflare has added Warp to the already existing 1.1.1.1 app that can be used with the Cloudflare DNS. As in the case of many VPNs, where latency and performance have always been an issue on the mobile web, Cloudflare claims that its new mobile-only VPN service will be as fast, if not faster than a traditional mobile connection. Warp will not only give users even more privacy online but it will also improve connections speeds and reliability over typical VPN connections. The secure connection not only applies to the browser, but also to internet traffic via apps. “Technically, Warp is a VPN. However, we think the market for VPNs as it’s been imagined to date is severely limited. Imagine trying to convince a non-technical friend that they should install an app that will slow down their Internet and drain their battery so they can be a bit more secure. Good luck,” Cloudflare CEO Matthew Prince wrote in a blog post. Besides protecting all traffic including encrypting non-encrypted connections, Warp’s key advantage is its performance. “Security is table stakes. What really distinguishes Warp is performance and reliability. While other VPNs slow down the Internet, Warp incorporates all the work that the team from Neumob has done to improve mobile Internet performance. We’ve built Warp around a UDP-based protocol that is optimized for the mobile Internet. We also leveraged Cloudflare’s massive global network, allowing Warp to connect with servers within milliseconds of most the world’s Internet users. With our network’s direct peering connections and uncongested paths we can deliver a great experience around the world. Our tests have shown that Warp will often significantly increase Internet performance. Generally, the worse your network connection the better Warp should make your performance,” Prince added. Currently, Warp is available only for mobile devices. The basic version of Warp is included as a free update to the 1.1.1.1 App. The company is also working on a premium version called Warp+ that will be even faster by utilizing Cloudflare’s virtual private backbone and Argo technology. However, users interested in using this service will have to pay a “low monthly fee” associated with it. Those interested in 1.1.1.1 App with Warp can download the app from the Apple App Store or the Google Play Store, and sign up for the waitlist. The company also has plans to come out with desktop versions of the app very soon. For more information about Warp, you can read the Cloudflare blog here.